A theoretical plate in many chemical engineering separation processes is a hypothetical zone or stage in which two phases, such as the liquid and vapor phases of a substance, establish an equilibrium with each other. Those zones or stages may also be referred to as a theoretical tray or an equilibrium stage. The performance of many separation processes depends on having a series of equilibrium stages and is enhanced by providing more such stages. In other words, having more theoretical plates increases the efficacy of the separation process be it either a distillation, absorption, chromatographic, adsorption or similar process. So-called bubble-cap or valve-cap trays are examples of the vapor and liquid contact devices used in industrial distillation columns. The trays or plates used in industrial distillation columns are fabricated of circular steel plates and usually installed inside the column at intervals of about 60 to 75 cm (24 to 30 inches) up the height of the column. That spacing is chosen primarily for ease of installation and ease of access for future repair or maintenance. Bubble-cap trays in an industrial distillation column. For example, a very simple tray would be a perforated tray. The desired vapor and liquid contacting would occur as the vapor flowing upwards through the perforations would contact the liquid flowing downwards through the perforations. 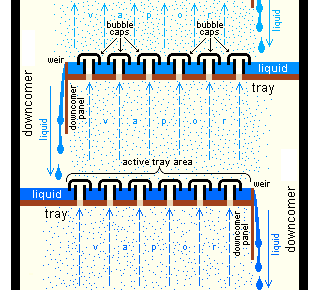 In current modern practice, as shown in the adjacent diagram, better contacting is achieved by installing bubble-caps or valve caps located at each perforation to promote the formation of vapor bubbles flowing through a thin layer of liquid maintained by a weir on each tray. To design a distillation unit or a similar chemical process, the number of theoretical trays or plates (that is, hypothetical equilibrium stages), , required in the process should be determined, taking into account a likely range of feedstock composition and the desired degree of separation of the components in the output fractions. In industrial continuous fractionating columns, is determined by starting at either the top or bottom of the column and calculating material balances, heat balances and equilibrium flash vaporizations for each of the succession of equilibrium stages until the desired end product composition is achieved. The calculation process requires the availability of a great deal of vapor-liquid equilibrium data for the components present in the distillation feed, and the calculation procedure can be very complex. In an industrial distillation column, the N t required to achieve a given separation also depends upon the amount of reflux used. Using more reflux decreases the number of plates required and using less reflux increases the number of plates required. Hence, the calculation of is usually repeated at various reflux rates. is then divided by the tray efficiency, , to determine the actual number of trays or physical plates, , needed in the ditillation column. The final design choice of the number of trays to be installed in a distillation column is then selected based upon an economic balance between the cost of additional trays and the cost of using a higher reflux rate. There is a very important distinction between the theoretical plate terminology used in discussing conventional distillation trays and the theoretical plate terminology used in the discussions below of packed bed distillation or absorption or in chromatography or other applications. The theoretical plate in conventional distillation trays has no height. It is simply a hypothetical equilibrium stage. However, the theoretical plate in packed beds, chromatography and other applications is defined as having a height. The material in packed beds can either be random dumped packing (1-3" wide) such as Raschig rings or structured sheet metal. Liquids tend to wet the surface of the packing and the vapors contact the wetted surface, where mass transfer takes place. The theoretical plate concept was also adapted for chromatographic processes by the British chemists and Nobel Prize winners, Martin and Synge. The IUPAC's Gold Book provides a definition of the number of theoretical plates in a chromatography column. ↑ 1.0 1.1 1.2 Kister, Henry Z. (1992). Distillation Design, First Edition. McGraw-Hill. ISBN 0-07-034909-6. ↑ 2.0 2.1 King, C.J. (1980). Separation Processes. McGraw Hill. 0-07-034612-7. ↑ McCabe, W., Smith, J. and Harriott, P. (2004). Unit Operations of Chemical Engineering, Seventh Edition. McGraw Hill. ISBN 0-07-284823-5. ↑ 4.0 4.1 4.2 Perry, Robert H. and Green, Don W. (1984). Perry's Chemical Engineers' Handbook, Sixth Edition. McGraw-Hill. ISBN 0-07-049479-7. ↑ B.S. Furnis et al (1989). Vogel's Textbook of Practical Organic Chemistry, 5th Edition. Longman Scientific. ISBN 0-582-46236-3. This page was last modified 04:39, 9 February 2010.